Dunmunkle Shire (1877-1995), created on 28 September 1877, was in the Wimmera region and to the north-east of Horsham. Its western and eastern boundaries were the Yarriambiack Creek and the Richardson River, both of which flow northwards and empty into lakes. The shire's main centres of settlement were at Murtoa and Rupanyup on the Wimmera Highway and, further north, at Minyip. Murtoa and Minyip are on the railway line from Stawell to Warracknabeal. 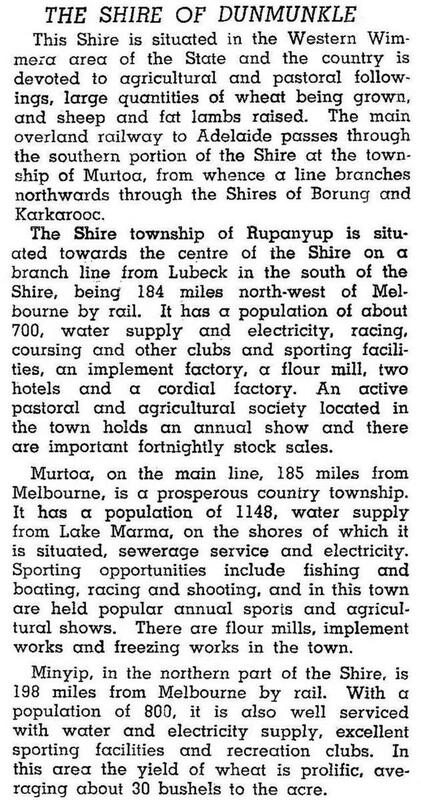 Rupanyup had a branch line from Murtoa during 1887-1983. Rupanyup is on the Dunmunkle Creek which is a minor watercourse, and the creek's name is of Celtic origin, meaning a great chief's dwelling. The Celtic name reflects the origin of several pastoralists who occupied grazing lands from the mid-1840s. Their influence is less evident, however, than that of the German-Lutheran settlers of the 1870s who established several churches and three schools in the shire. Dunmunkle Shire's administrative centre was at Rupanyup, but council meetings alternated among the three main towns until the 1930s. It was a cause of some acrimony between townspeople. Dunmunkle's principal industry has been wheat growing, and there have been flour mills at the three towns. Murtoa's was the largest, surviving until 1977, which reflected Murtoa's population being the largest of the three. All of the shire had livestock water supply from Grampians storages and town water from the same source. District or bush nursing hospitals were established at the three towns, and in the late 1980s they formed the Dunmunkle Health Service. Murtoa retained limited hospital facilities, with more extensive facilities provided at Horsham and Warracknabeal. In 1994 Dunmunkle Shire had 92% of its area of 1550 sq km given to farming. There were 159,000 head of sheep and lambs, and grain harvests were 71,756 tonnes of wheat and 48,212 tonnes of barley. On 20 January 1995, most of Dunmunkle Shire was united with Warracknabeal, Karkarooc and part of Wimmera Shires to form Yarriambiack Shire.